Like Creme Eggs and hot cross buns, Simnel cake is is one of those short-lived treats that only appear around Eastertime. It’s usually an Easter cake, but did you know that it was originally made for Mother’s Day? I could make a Simnel cake for my mum since she loves marzipan. She's less fond of fruit cake, though, so, what other cake uses marzipan in abundance? Battenberg! 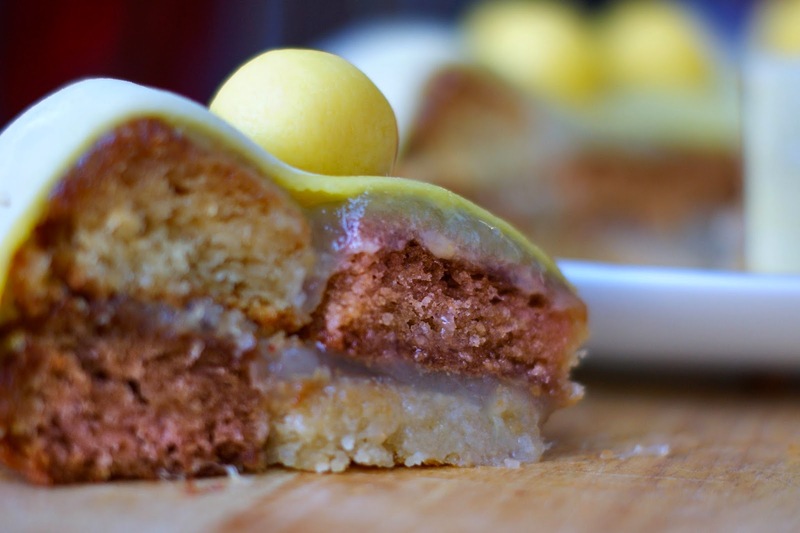 This cake might look like a Simnel cake from the outside, really, it’s a Battenberg! I’ve used my recipe for eggless sponge cake, because it's a handy one to have for those times you want to bake, but don't have eggs or butter. Preheat your oven to 200°C/400F/gas mark 6. Whisk the self raising flour mix, ground almonds, baking power, bicarbonate of soda, salt and icing sugar together to remove any lumps. Add to the condensed milk, oil and water and mix until smooth. Divide the mixture into two and add the food colouring to one half. Stir until the colour is completely mixed in. You want the batter to be a few shades deeper than the colour you want the cake to be as it fades when it bakes. Pour each half of mixture into its own greased and lined 20 cm cake tins and bake for 8-10 minutes, until the whole cake has risen, (DO NOT OPEN THE OVEN!! It'll sink if you do.) then turn the oven down to 160°C/325°F/gas mark 3 for a further 5 minutes. Allow the cakes to cool in the tins for about 15 minutes before turning them out on to a cooling rack. Once cooled, trim any uneven bits off the cakes - if you don't, it won't be level when you build the Battenberg and the slices will start to topple once cut. Use a large biscuit cutter to remove a circle of cake from the centre of each cake. Gently remove the centre and insert it into the opposite colour. Spread apple sauce over the top of one cake and sandwich the other on top. Spread a little more apple sauce on top of that, and around the edge of the cake. Roll out the marzipan to ¼ cm thick and place on top of the cake, smoothing it down the sides. Trim the edges to neaten. Make 12 balls from the remaining marzipan and place around the rim of the cake. Use a little water or apple sauce to ‘glue’ the balls on to the marzipan top. Advance warning - it’s Mother’s Day this Sunday. Don’t worry, there’s still time to post a card, shop for a gift…and buy the ingredients for this cake. This is such a clever idea! Just for information, my local M+S sells Simnel cake (in slab form) all year round. Delicious and reasonably priced. I'd suggest using coconut cream in place of the condensed milk and increasing the sugar. I haven't tried that yet, though, so I'm not sure of exactly how well it would work. Perhaps soy cream with extra sugar, but I think you'll need something thicker like coconut cream.